U.S. GDP growth has been relatively slow over the past seven years. But with inflation and interest rates still at low levels, the next recession could still be many years away. In the past several years, Americans have been told numerous times that we're in the midst of the slowest U.S. economic recovery on record. Since bottoming out a little over seven years ago, real GDP has grown at an average annual rate of 2.1%. The total increase over that period is 15.5%. In many previous recoveries, GDP rose by that amount in half the time. Some of the more extreme pundits have argued that the weak recovery foreshadows an economic collapse. Even highly respected investors like Bill Gross and Jeffrey Gundlach have made alarming comments this year, telling investors to avoid stocks, which they see as massively overvalued based on recent declines in corporate profits and the lack of robust economic growth. On the other hand, the current period of expansion is becoming one of the longest-lasting recoveries on record. And the slow pace of the ongoing recovery is actually one of the keys to its longevity. That could lay the groundwork for ongoing stock price appreciation. In the years following the Great Recession, many economists expected annual real GDP growth to rise toward 3% as the economy bounced back. However, the hoped-for uptick in growth never happened. If anything, U.S. GDP growth has been slowing. In two of the last four quarters, real GDP has increased less than 1% on an annual basis -- although growth did bounce back to 2.9% last quarter, according to preliminary government estimates. At this point, very few economists still think that a return to faster growth is right around the corner. Nevertheless, while growth may not be speeding up, it could continue to plod along for many more years. Earlier this year, analysts at Morgan Stanley predicted that the U.S. economy could continue expanding until at least 2020. That would mark the longest period of uninterrupted economic growth in U.S. history. That forecast is roughly in line with the Congressional Budget Office's own projections. In an August update to its long-term economic outlook, the CBO affirmed that it expects the economy to continue growing for at least the next five years. The longevity of the current economic expansion -- already the fourth-longest in U.S. history -- is directly related to the slow pace of economic growth. Rapid real GDP growth eventually puts strain on the economy, driving an uptick in inflation. That in turn forces the central bank to raise interest rates, which makes borrowing and investing more expensive and frequently results in a recession and a big pullback in stock prices. This process hasn't even begun in the past seven years. With GDP expanding at a moderate rate, inflation has remained below the Federal Reserve's 2% target for almost the entire period. 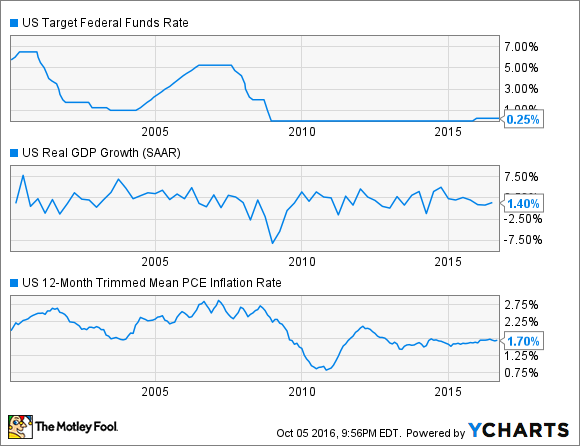 As a result, the Fed has kept interest rates near zero, posing no threat to continued economic growth. Most members of the Federal Open Market Committee don't expect short-term interest rates to surpass 2% until 2019. Compare that to the economic expansion running from late 2001 through late 2007. By mid-2004 -- less than three years into that recovery -- inflation had moved above 2%, and it never looked back. As a result, the Fed began to rapidly increase interest rates, which rose above 5% by the middle of 2006. That ultimately helped burst the housing bubble, sparking the Great Recession -- and causing the S&P 500 to plunge by more than 50% between October 2007 and March 2009. Interest rates, GDP growth, and inflation, 2000-present. Data by YCharts. Thus, a weak recovery just might be a blessing in disguise. After all, even a weak recovery is better than a recession. Looking ahead, there are plenty of reasons for optimism. For one thing, oil prices are stabilizing, which could stimulate more investment in energy projects -- an area that has been a big drag on U.S. GDP growth for the past two years. That could soon change. During the recent presidential campaign, both Hillary Clinton and Donald Trump called for increased spending on infrastructure projects. (It was one of the few things they agreed on.) Donald Trump's victory makes it especially likely that infrastructure spending will rise, as he should enjoy support from his fellow Republicans in Congress. Trump also plans to cut taxes, which will provide further fiscal stimulus. Higher investment in infrastructure will provide a short-term boost to GDP, and it could also enable faster long-term productivity growth, which is a key determinant of GDP growth. It would also aid long-suffering heavy-equipment manufacturers like Caterpillar. By contrast, if inflation were above 2%, an uptick in government spending would threaten to send inflation spiraling higher. That would in turn provoke sharp interest rate increases by the Fed, undermining economic growth. In other words, if GDP had risen faster over the past few years, then policymakers would probably be out of options for stimulating further growth. The modern discipline of macroeconomics came about in response to the Great Depression as John Maynard Keynes and his followers tried to determine how to smooth out economic cycles using fiscal and monetary policy. The goal was to replace the historical pattern of booms and busts with steady growth. Of course, fine-tuning macroeconomic policy in accordance with Keynesian theory is extremely difficult. Despite their best intentions, policymakers have not been able to completely tame the business cycle. In some cases, bad government policies may have even aggravated the economy's boom-bust tendencies. Right now, there's clearly room for faster economic growth. While most economists and many politicians have called for higher government spending to rebuild our crumbling infrastructure, budget squabbles between President Obama and Republicans in Congress have always gotten in the way. With Republicans controlling both the White House and Congress for at least the next two years, this gridlock could ease, helping the economy live up to its potential. Still, it's important to remember the goal of fiscal and monetary policy: steady, sustainable growth. The current period of economic expansion -- seven years and counting, with no signs of runaway inflation or recession on the horizon -- seems as close to that ideal as policymakers have ever managed in eight decades of trying to regulate GDP growth. To be clear, that's no guarantee of steady stock market gains. Indeed, stock market corrections happen about once a year, on average, and occur in both good and bad times. Moreover, stock valuations are relatively high by historical standards. Nevertheless, if the economy can keep growing slowly and steadily, corporate profits should start rising again. In the long run, higher corporate profits translate to higher stock prices. In this context, Jeffrey Gundlach's advice to "sell everything" is clearly an overreaction. Perhaps we shouldn't be feeling so glum about the slow recovery after all.